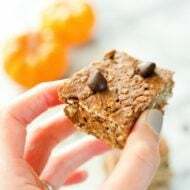 Sweet potato toast is all the rage right now and given that I’m a sweet potato lover I had to jump aboard the sweet tater toast train and see what all the hype is about. Funny story… I tried sweet potato toast for the first time a couple months ago and I did the toaster oven method, which (spoiler alert) was an epic fail. I thinly sliced my sweet potato and toasted it two times, but the sweet potato still wasn’t cooked. It was hard and crunchy and on top of it, the toaster oven also set off the smoke detector. So yeah, maybe I didn’t do it right, but for now I’m with Tasting Table on the fact that sweet potato in the toaster oven doesn’t work. That said, sweet potato toast is still possible and absolutely delicious. You just have to break out the big guns, AKA a real oven. It may take a bit longer, but the sweet potato actually gets cooked, plus you won’t have to worry about your smoke detector going off. So worth it! The oven method is actually simple and isn’t very dissimilar from my recipe for coconut oil roasted sweet potatoes. Cut sweet potato lengthwise into thin slices, about 1/4″ thick. <— This is important. Coat sweet potato slices with a small amount of oil. Season with salt and pepper and place on a baking sheet with a little room between each slice. This is where your toaster oven comes in handy because you can store any extra slices you’ve baked in the fridge and reheat them in the toaster oven. It works great for this! 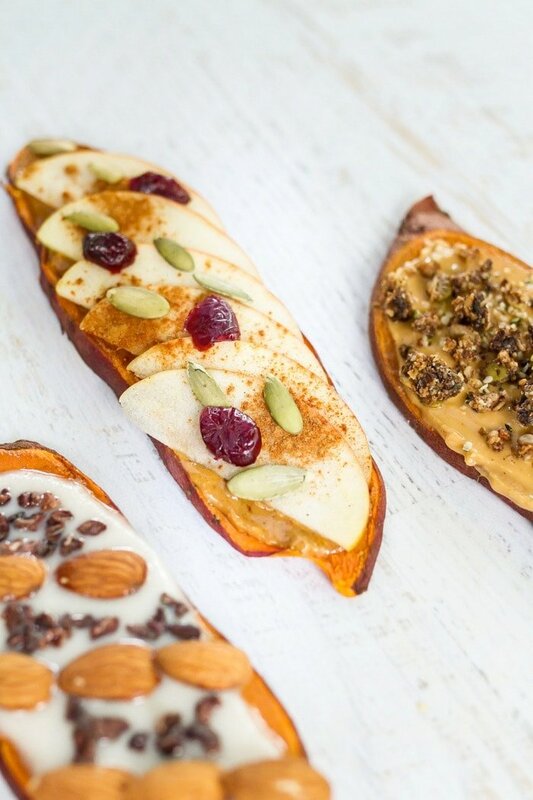 Okay so once your sweet potato toast is cooked to perfection, you’re ready for the fun part — the toppings! 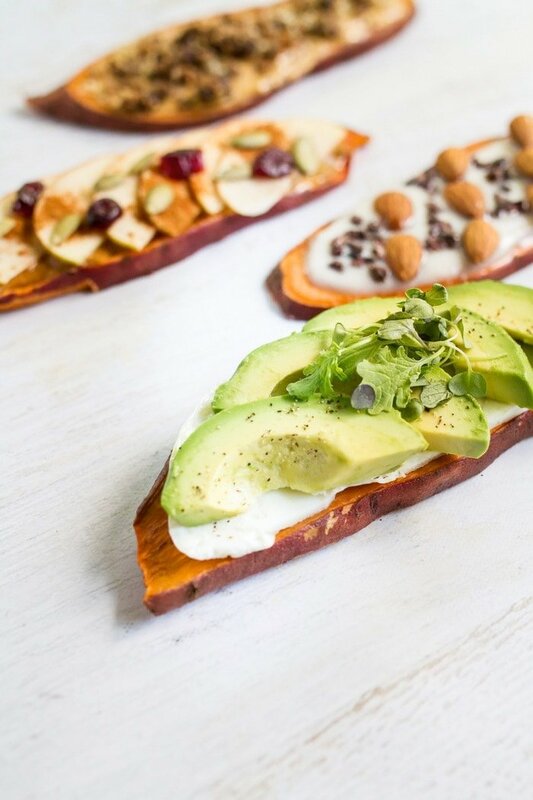 Maria and I had a blast coming up with the topping combos for this breakfast sweet potato toast and decorating each slice was like a fun little art project. I love them all, but if you made me choose a favorite I’d probably pick the Apple Harvest with peanut butter, apple slices, cranberries, pumpkin seeds and cinnamon. 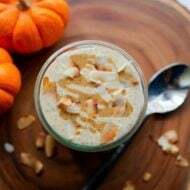 Mainly just because I love peanut butter and I’m swooning over everything fall right now. Okay so let’s break down all four topping ideas! 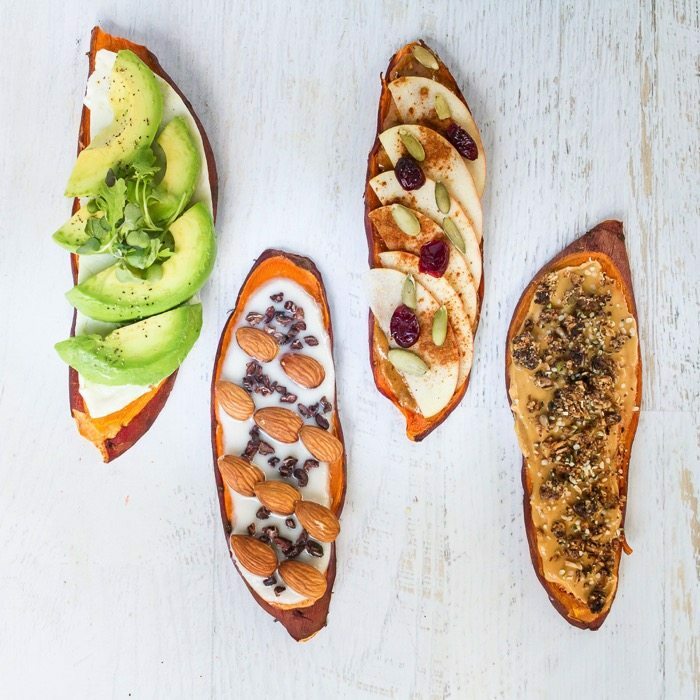 When it comes to eating sweet potato toast there are a few methods. You can use a fork and knife as you would other breakfast treats like waffles and pancakes or you can pick up the sweet potato toast and eat it like regular toast. Both options work great, it just depends on your preference. One note, if you’re sweet potato slices are huge like mine, you might need to use both hands to hold it. With smaller pieces, you should be totally cool using one hand. 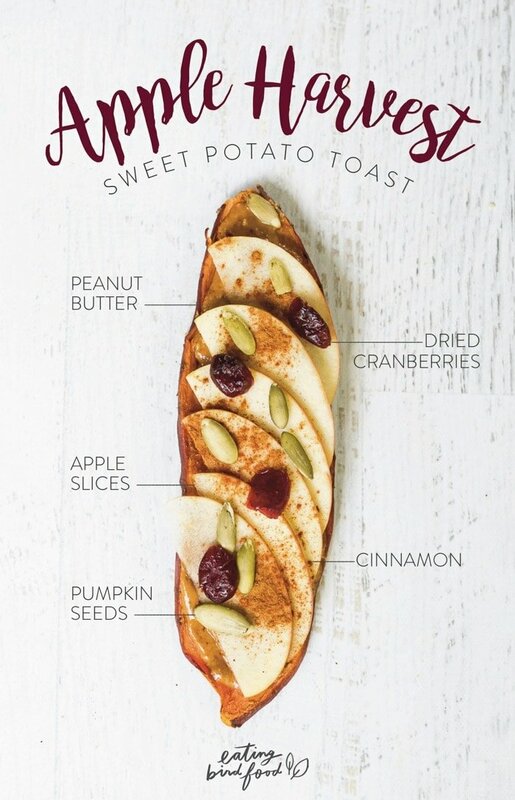 Have you tried sweet potato toast yet? If not, I highly recommend making some for breakfast tomorrow. You won’t regret it. My mouth is watering! 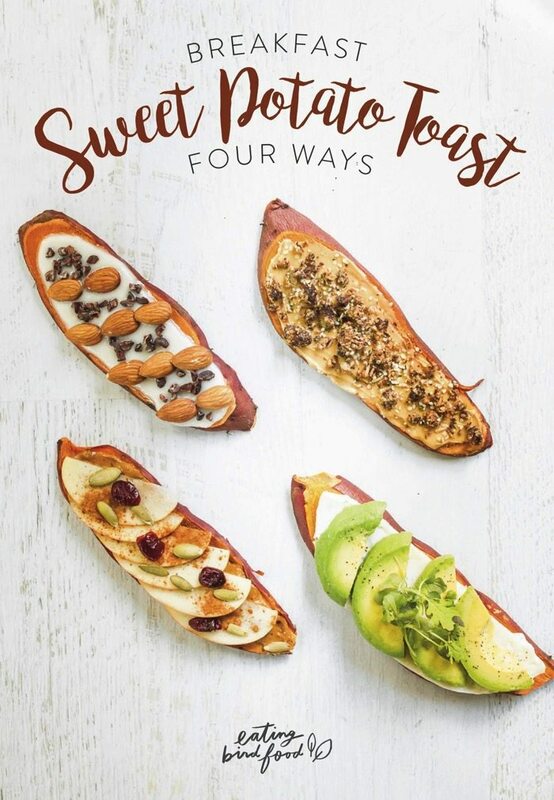 I already baked my sweet potatoes whole yesterday, so while it definitely won’t be toast, I may split one in half and fill each with different toppings. Last week I had baked sweet potato with yogurt, apple, spices, and almond butter. It was delicious and so filling! Your photography is gorgeous too! Ohh!! Yes, I’ve been doing stuffed baked sweet potatoes too! 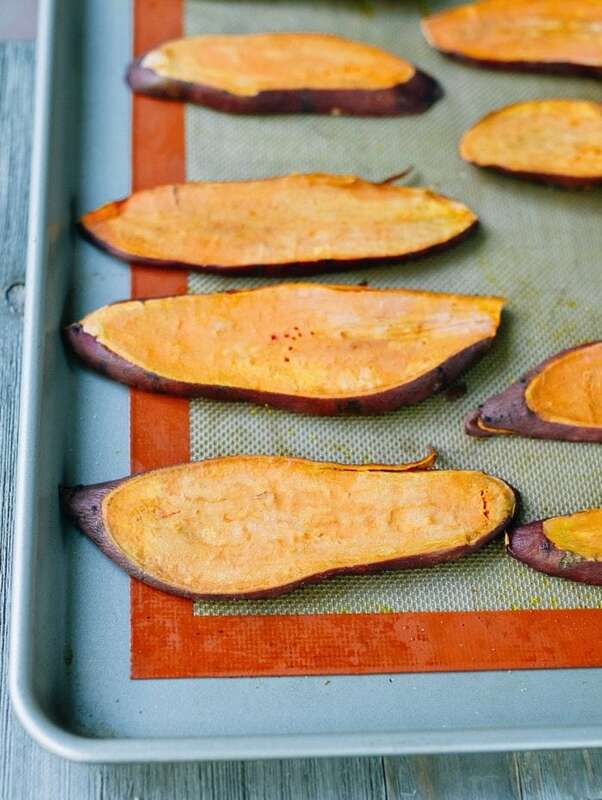 There’s really no wrong way to eat a sweet potato. 🙂 Enjoy lady! These look so delicious! Especially the Apple Harvest one, definitely making them soon. I always get a bit stuck on the toppings and this will help to broaden my horizons! Yay! You’ll have to let me know what you think, Dominika. GIRL this is AMAZING! Great job! Wow, looks outstanding. Always looking for a new option for one of my favorites, sweet potatoes! Thanks! 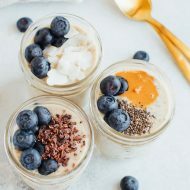 Wow, I do whole30 and this looks awesome! I love the idea of almond butter with granola on top. Thanks so much, Brittany! I love this idea! The names and pictures are so cute! Thanks so much Molly. I had fun thinking of the different names and Maria made the photos. She’s a graphic design wiz! I want to try this. Looks so good. Any tips for cutting the sweet potato so evenly? Having a large, sharp knife is key. This allows you to press down with both hands. You can also cut a little chunk off one side so the sweet potato lays flat for slicing. Maybe I should make a quick video. Since I sliced my finger trying to cut the potato. I’ve heard so much about this lately & would love to try them. Yours have been the best combination of toppings that I’ve seen yet! Do you have any tips on how to slice them so thin and perfectly?? Having a large, sharp knife is key. This allows you to press down with both hands. You can also cut a little chunk off one side so the sweet potato lays flat for slicing. I have been wanting to try this for so long, and I love your topping options. I tried the toaster method too—So didn’t work–but this perfect. I am going to try them all. I can never have too many sweet potatoes. I love all of these ideas! 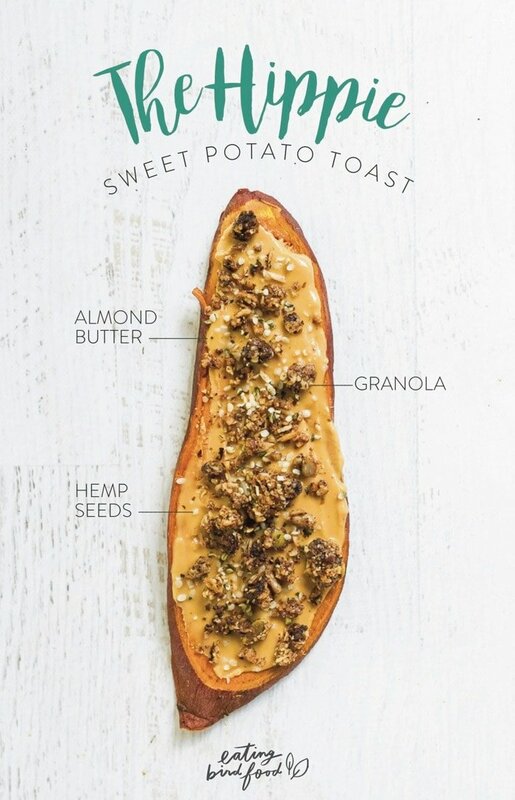 Who needs toast when you can put it on a sweet potato! 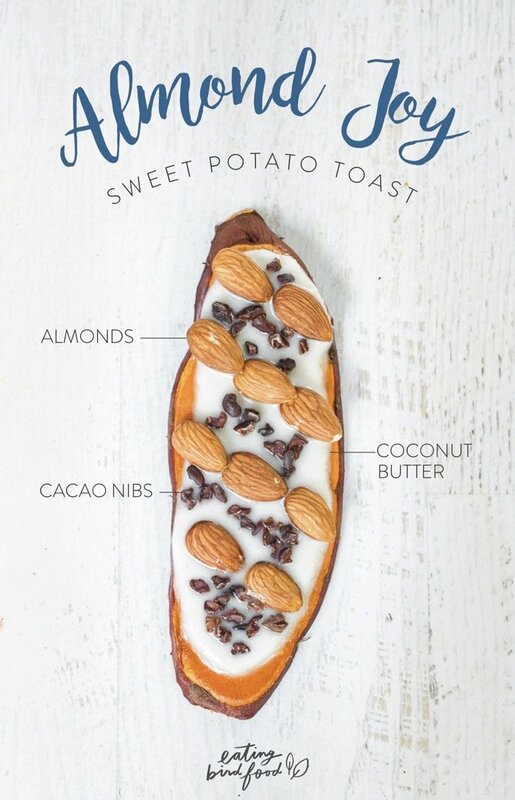 I’ve been wanting to try sweet potato toast! Love these different toppings! 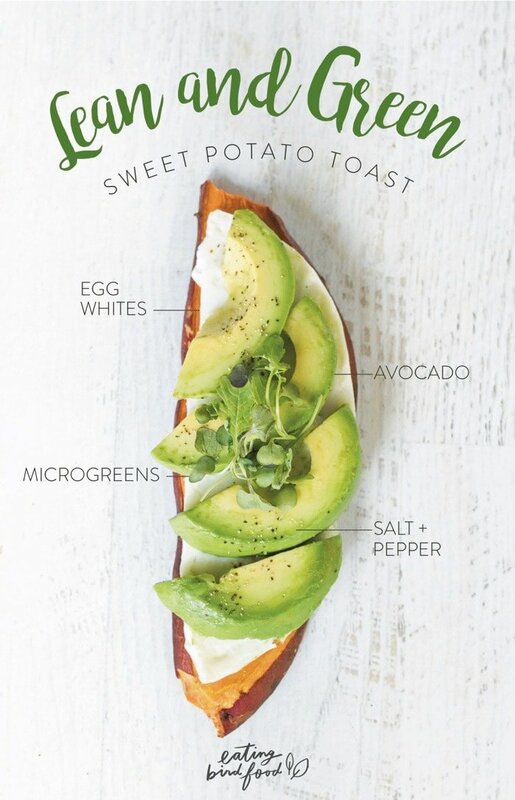 I’ve never heard of sweet potato toast, genius! Thank you for the recipe. Love your blog. OMG, thanks for sharing! I recently tried out sweet potato toast in my toaster, but my toaster did not like!!! Time to try it via the oven! Your combos look delicious! Such gorgeous presentation! They all sound delicious! We are having 12-15 people over on Christmas morning for breakast. They stop at diferent time between 8-10 am. Is there a way to keep them warm once the toppings are on? Or can they be eaten at room temp. Thanks. I’d probably add the toppings right before serving, but they can definitely be eaten at room temp if you’re okay with that. Enjoy and Merry Christmas. I can’t wait to try these. I don’t like nut butter so I will use sunflower seed butter, which I love. Looks so yummy. 🙂 Thank you for a recipe with sweet potato toast without a toaster. Can they be stored in the fridge for a few days of breakfasts?